Use Arena Metrics to track and chart a variety of statistical data. 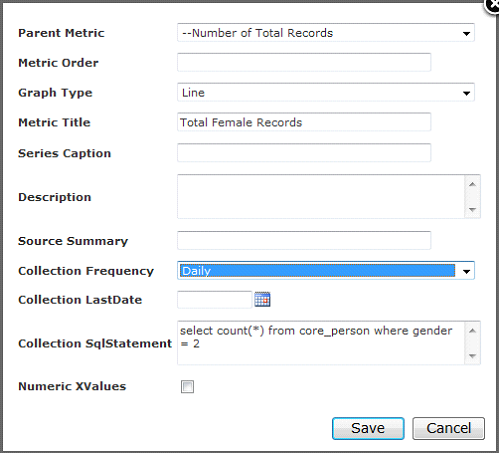 You can manually enter the metric data or use a SQL query to generate data automatically. 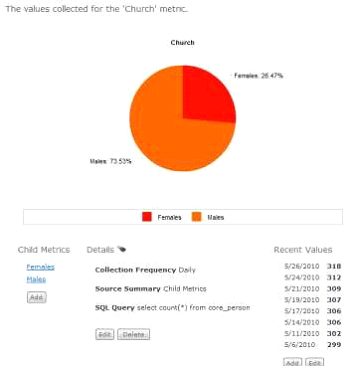 Use Child Metrics to organize different metric charts and display metrics in either an area, pie chart, multi-line, area stacked, or line chart format. 1. 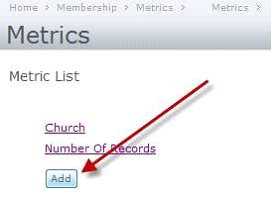 From the Membership menu, click the Metrics option. 3. Enter a Title for this metric. 5. Select the Metric from the list. 6. Click the Edit button. 7. Enter the required and desired fields. 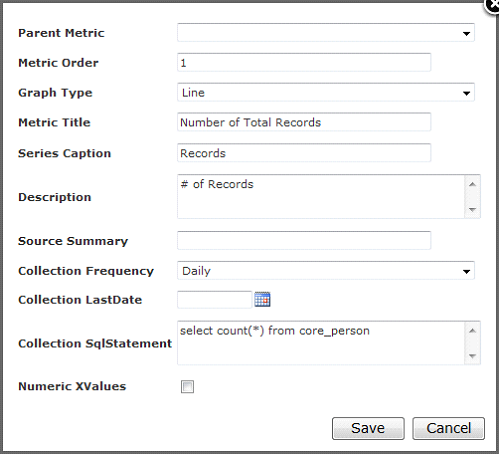 •Parent Metric – Select the parent metric if this is a child metric. •Metric Order – Enter 1 if not using child metrics. •Graph Type – Select graph type. 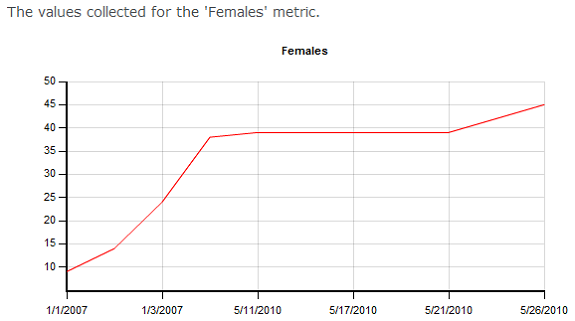 •Metric Title – Enter a title for this metric to display above the graph. •Series Caption – Enter a caption for this metric to display below the graph. •Description – Enter a description to display above the graph. •Source Summary – Enter a source summary for this metric. •Collection Frequency – Select the frequency the data should be collected. •Collect Last Date – This is the last date data was collected. •Collection SQL Statement – Enter the SQL statement for this metric. 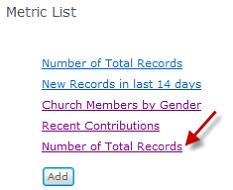 •Numeric XValues – Check this box if you would like to display the X-axis values for this metric. 9. Click the Security icon to set security for this metric. 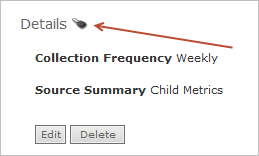 Select the Metric to which you would like to add a child metric. 2. Enter a Title for this Child Metric. 4. Click the Child Metric link. 6. Enter the appropriate fields, including the SQL statement for this metric.